A comment left by Anonymous posted here is asking about the coin in the picture. Some Brit is selling the coin on E-Bay and Anonymous is asking what it is. 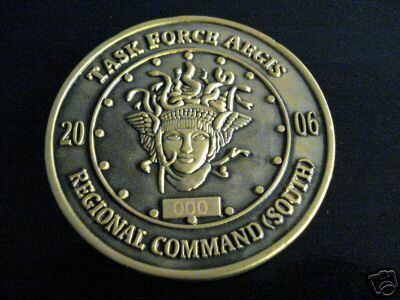 The pictured coin is a challenge coin and because it is being auctioned by a Brit, I have to assume that it was presented to a British soldier by the commander of Task Force Aegis. In Greek mythology, the Aegis is the shield used by Zeus and adorned with Medusas head. I can tell you right now that no American or Canadian soldier would be hawking his challenge coin on E-Bay. Challenge coins from task force or mission commanders are the most prized because they denote you were there. 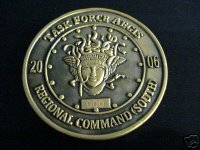 Challenge coins are typically presented by senior officers and senior NCO’s. These coins are typically presented as spot awards for recognizing good work. Whenever a flag officer visits his aide always asks for a number of soldiers to receive a coin from the general. The staff or senior NCO’s would nominate soldiers to receive the coin. I have a few coins. I received coins from the commanders of Task Force Orion and the Tarin Kowt PRT, both of which I will treasure for the rest of my life. Another coin was presented to me by the officers and men of the 955th Engineer Company (Pipeline) when I left to take command of another unit in 1998. I and all the other soldiers of the 955th were presented coins by the Korean Service Corps (KSC) for training them on the Inland Petroleum Distribution System back in 1997. We call these coins challenge coins because we in the military like to drink. Let’s say you decide to pop into the Officers or NCO Club, the Regimental Mess, or any off post drinking establishment. Let’s say that you run into someone that you served with on a previous deployment or you both were in the same unit in the past. If your buddy puts his coin on the table and you don’t have yours, the next round is on you. If you were prudent enough to have your coin on your person, the challenger buys! 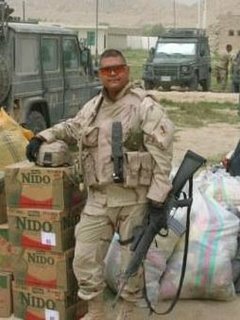 I typically carry my 955th Eng Co and KSC coin with me on all military related ventures in Missouri. I didn’t bring them with me to Afghanistan because I didn’t want to lose them and there is no booze to be had here anyway. I have an open invitation to visit many of the Patricia’s I served with and should I; I will have my Task Force Orion coin with me! If I am in Texas or the Washington DC area I will have my PRT coin with me for sure. So Anonymous, I hope I answered your question. I am kinda miffed that this coin is being auctioned because there are many soldiers here in Regional Command South that are deserving of this coin. Oh well. Very interesting and informative...it's always fun to find out about a coin that is rare or unique. It is nice post i am searching about these coins now days and get a cool info that these coins used in the army too as a Military Challenge Coins have you any info about it?